TET 2018 Online Form In these posts we recommend the Upcoming jobs Notification, exam of Bihar TET, and Odisha TET, UPTET and State Wise dates of Teacher Eligibility Test. UPTET 2018 Online Form Those who are waiting to fill form of TET (Teacher Eligibility Test) State Wise specially in Uttar Pradesh than Government has said to official newspaper media that UPTET HELD every year two times along with UP Assistant Teacher Recruitment 2018. 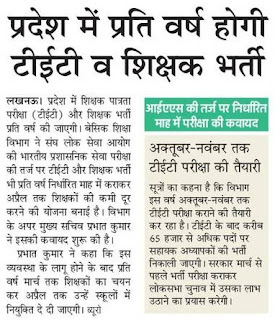 UP Government has already approved to engage Primary Teacher Jobs to B.ED (Bachelor of Education) which was previous only BTC Candidates can apply. In current 68,500 vacancies FILLED under D.EL.ED qualification, the ratio is only 1 by 2 which means who have applied for UP 68,500 Vacancies have 100% Placement in UP Primary Teacher Recruitment 2018. UPTET 2018 Notification This year Basic Shiksha Parishad given NOC to taken admission directly in Private and Govt BTC or B.ED-BTC College. 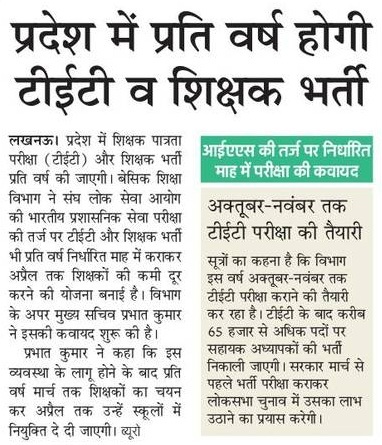 Many B.ED candidates already applied and Paid BTC Seat Allotment of Rs 10,000 but with new decision from Ministry of Education department to make rules of rules and regulation of B.ED in 1st to 6th classes. Resulted in many applicant (WHO HAVE B.ED Degree already) have not paid BTC college fees. UPTET Date 2018 Same as Uttar Pradesh Lok Sewa Ayog Civil service examination, basic shiksha Vibhag will also conduct UPTET Exam two times or 1 time recruitment of Teacher and UPTET to reduce shortage of teacher in primary school. Head of department Prabhat Kumar started making proforma of it. UPTET Latest News 2018:- Prabhat Kumar said every in March Month we select Teacher and give joining letter in April. 1. In October Number TEACHER Eligibility Test may be conducted. 2. After TET Exam again 65,000 vacancies advertisement published. 3. It is expected government will take benefit of filling teacher posts in Lok Sabha Election. Gujarat TET 2018:- Teachers Eligibility GSEB Gujarat Secondary Education Board (GSEB) conducts TET every year exam was conducted on September at various centers across the state. ASSAM TET 2018:- RMSA Assam Teacher Eligibility selection Process 100 marks of 100 Multiple Choice Questions (MCQs), each one of them carrying equal marks]. The Exam conducted tentatively in the November month Place of Examination at Guwahati.